Dazzling, colorless diamonds have been the hallmark of a traditional engagement rings for years, but tradition is turning a corner. Diamond-less alternative engagement rings are leaving their mark and pushing diamonds out of the spotlight to become a new favorite engagement centerpiece. Rubies, sapphires, morganite, pearls, clear sparkling moissanite and other regal gems now hold court where diamonds once reigned supreme. And the result? Non-diamond engagement rings with pure elegance and amazing style! Choose your birthstone, a gem in your favorite hue or just something completely unique to craft an engagement ring that wows…without diamonds. These 10 rings prove that the most romantic and breathtakingly beautiful engagement rings don’t need traditional diamonds to work their magic! Gems of the sea, pearls have been treasured for centuries. These beautiful beads come in a variety of colors like blush and black, but we love the traditional milky hue of a white pearl. As the light hits this exquisite gemstone, colors emerge to impart pale pinks and other subtle shades. A pearl is classic, yes, but it’s also a rare centerpiece for an engagement ring. Choose a pearl that flatters your hand—go big, small or in-between—and set your pearl solo. 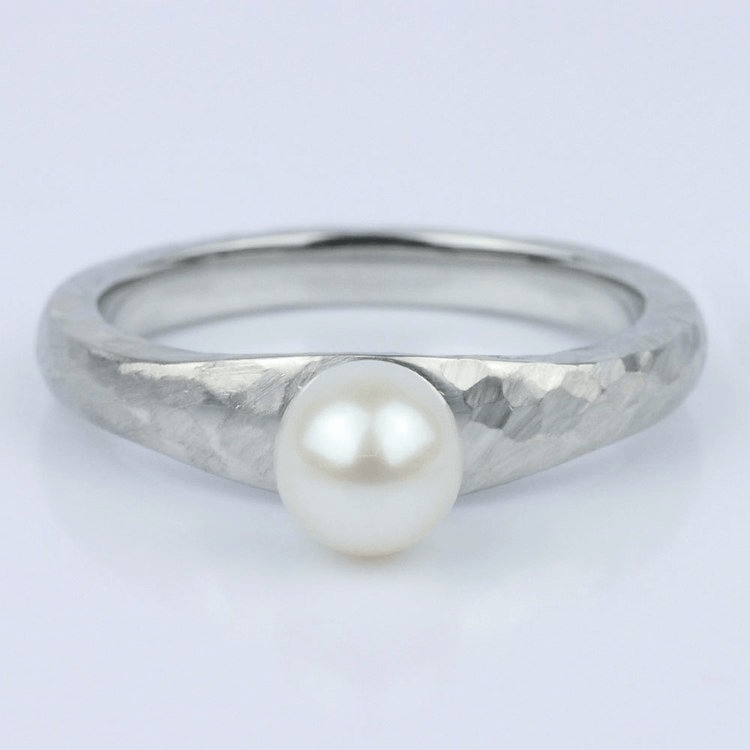 This pearl solitaire ring features a classic white pearl set within a hammered platinum band. Why choose one shade for your engagement ring when you can select a row of colors? Play with color to create your own design. 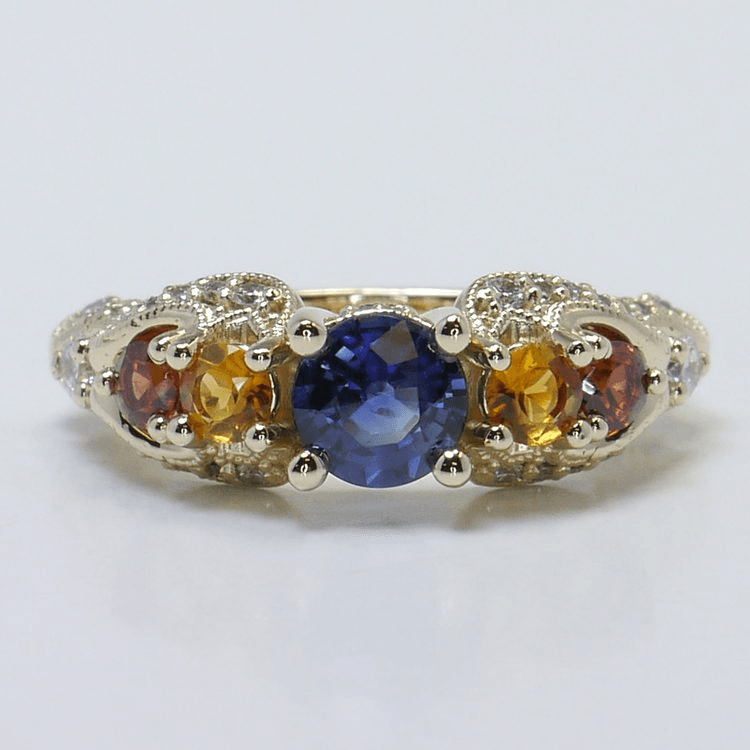 This antique-inspired ring features a center sapphire bordered by yellow topaz and rubies. For a hint of fire, tiny sparkling diamonds hide within the inside of the band. You can wear black to a wedding! Especially your own. The centerpiece for this gothic-inspired engagement ring is nontraditional and bewitching. Featuring a three-carat black diamond accented by two drops of red rubies, this ring is set within a white gold band. Custom designed engagement rings allow you to craft the ideal ring for your fiancé; any idea can inspire an engagement ring design. The ocean—and the legend of the mermaid—created the magical design for this custom ring that showcases a platinum and diamond mermaid floating on a 12.2 carat blue topaz wave with her hair flowing behind her. A remarkable diamond alternative, naturally colorless moissanite is the closest gem you can find that sparkles like a diamond. This isn’t a faux dupe, moissanites are lab-created gems that exist in nature (like diamonds). 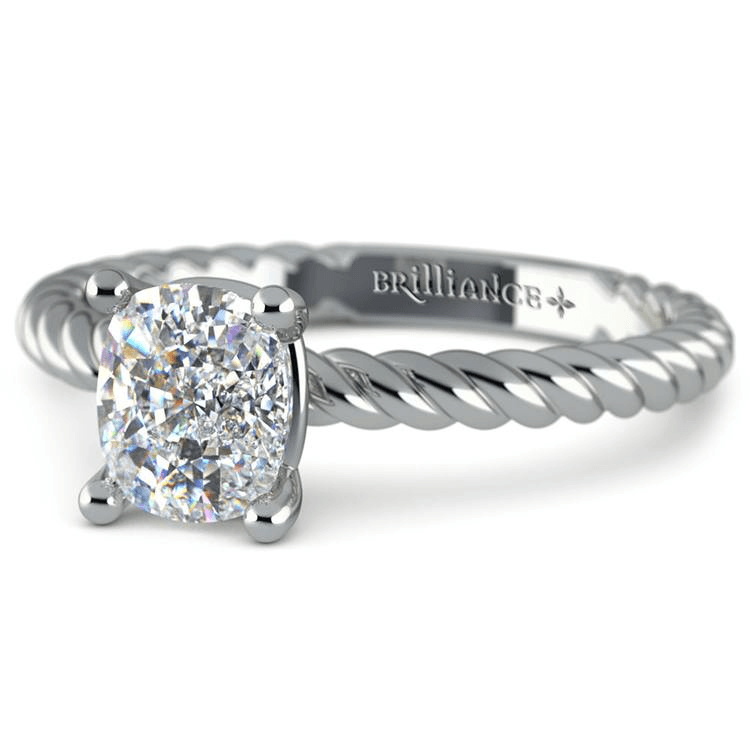 This twisted rope moissanite solitaire mixes the old and new with a modern moissanite gem in a vintage cushion cut, offering more fire than a diamond at a fraction of the price. Sapphires have been popular for ages and have decorated royal engagement rings (Princess Diana and Princess Eugenie). 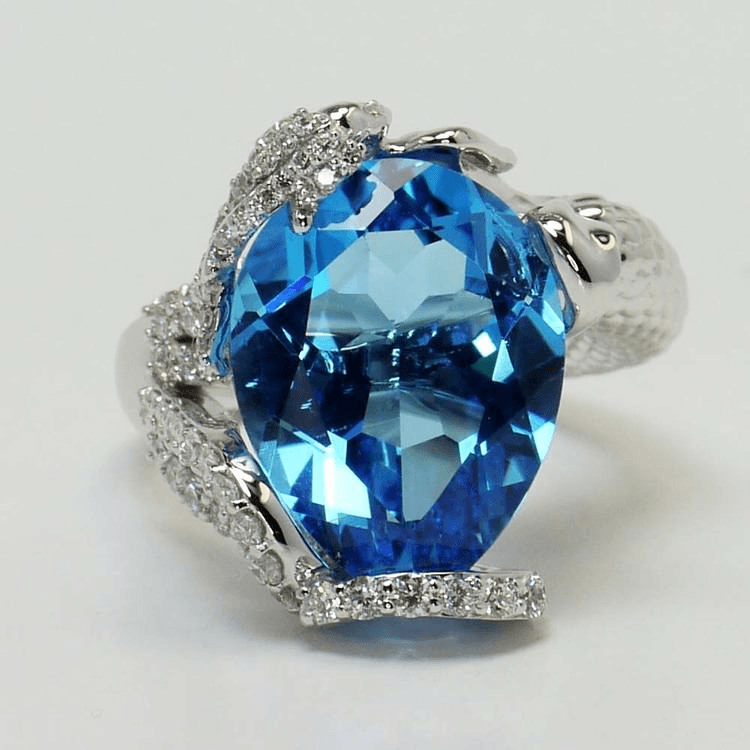 Sapphires come in a rainbow of hues, but blue is by far the most popular. 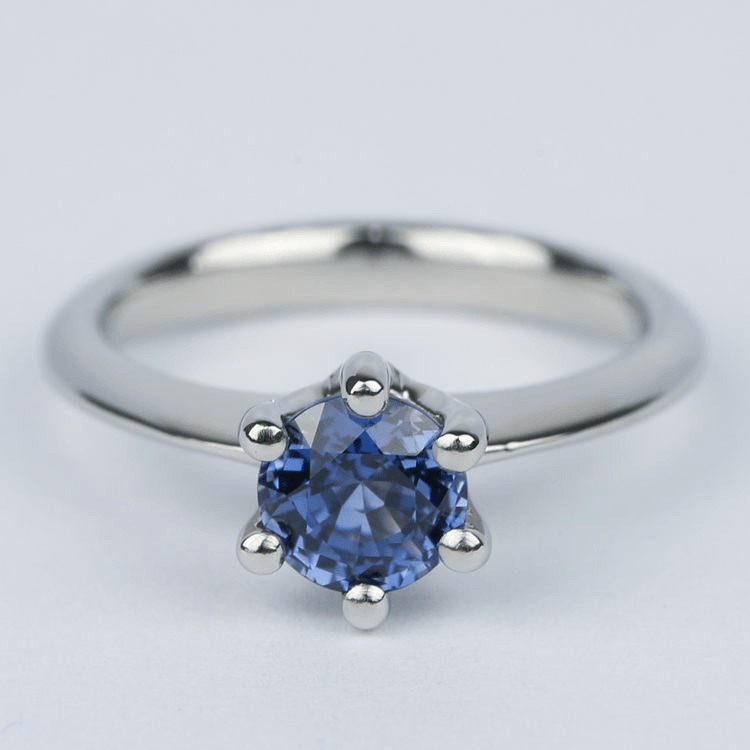 This classic sapphire solitaire is set in white palladium to showcase the deep hue of the stone. Thinking about a Valentine’s engagement? 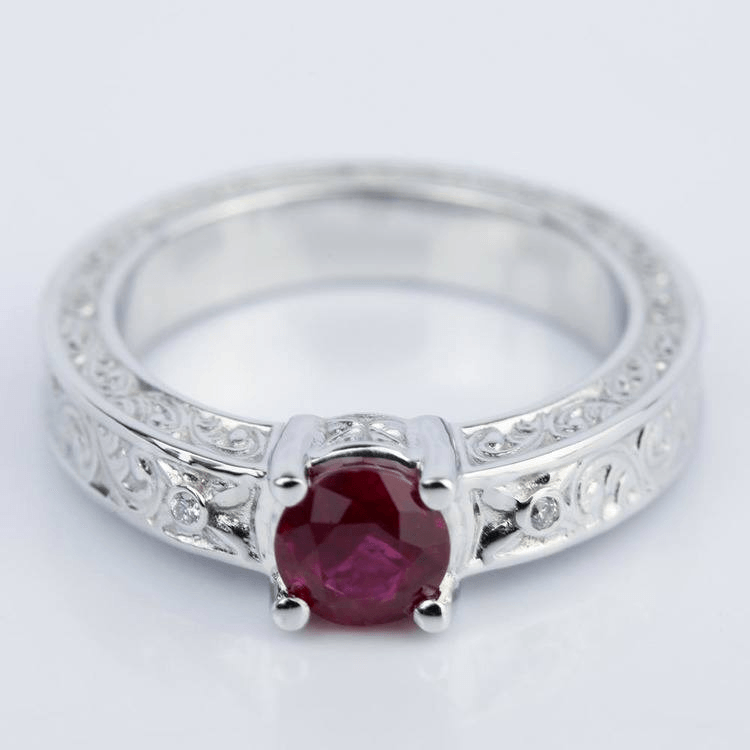 Choose a red romantic ruby as the center stone. This ruby engagement ring is accented by two tiny glinting diamonds set within a white gold band. Scrolled details elevate the antique-inspired elegance. 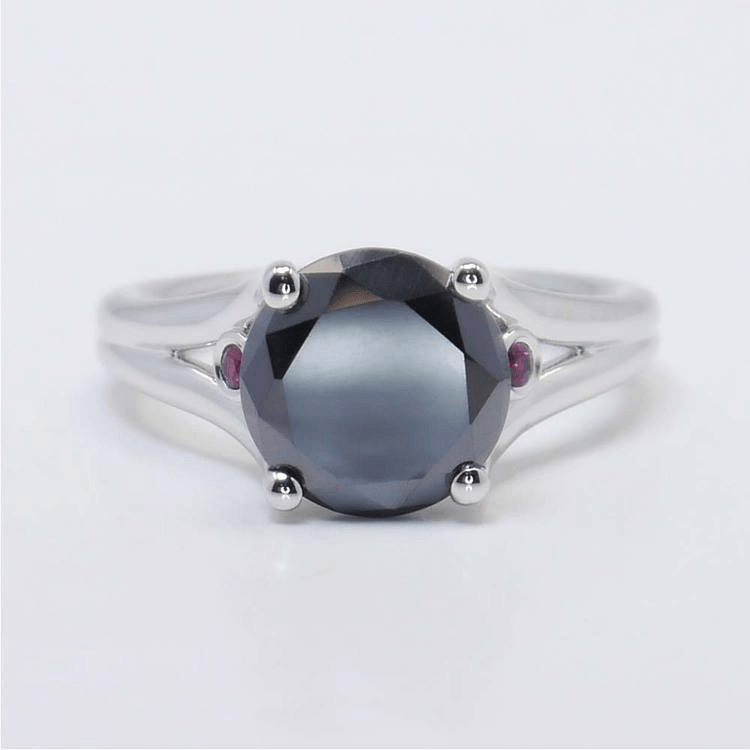 Alexandrite is not a well known gemstone, but the violet hue of Alexandrite makes it a memorable and unique choice for an engagement ring. Choose a cool-hued setting like white gold; the light hue best showcases the color saturation of the stone. 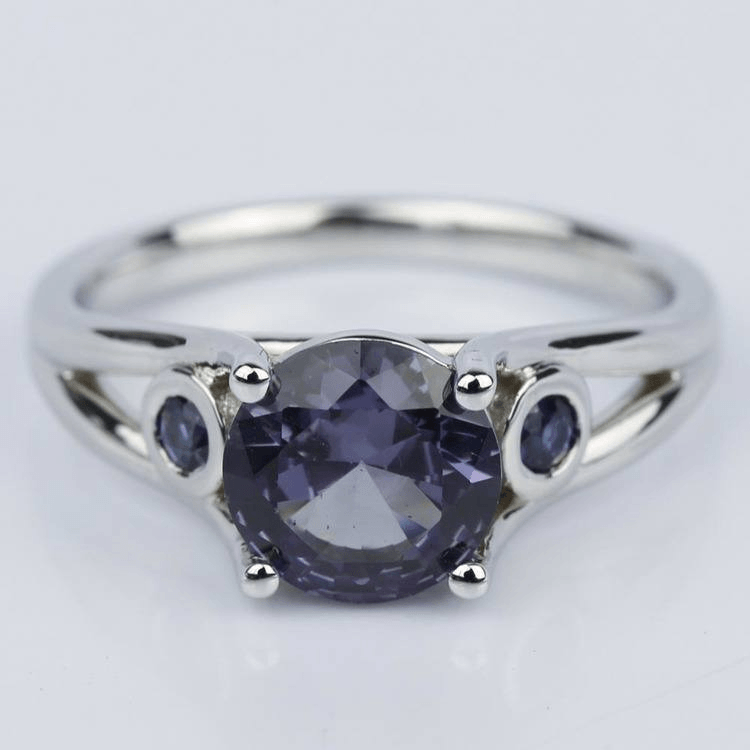 This custom gemstone engagement ring features a bold Alexandrite bordered by two small blue sapphires. Rose gold embraces romance and style. This hue—and metal—has taken the fashion world by storm, and it continues to remain popular. 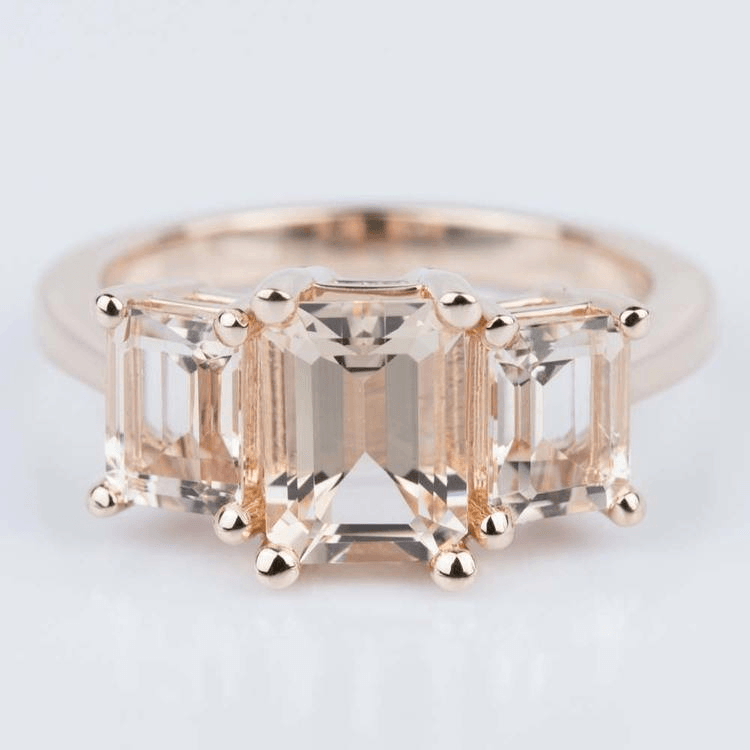 Morganite is a blush hued gem that resembles a rose gold hue, and, of course, this warm pink gem looks amazing when set within in rose gold. This statement-making engagement ring includes a trio of emerald shaped morganite resting within a 14 karat rose gold band. The look is simple, clean and romantic. For a refined style, create matching rings that you both wear and that serve as a dual engagement and wedding band. 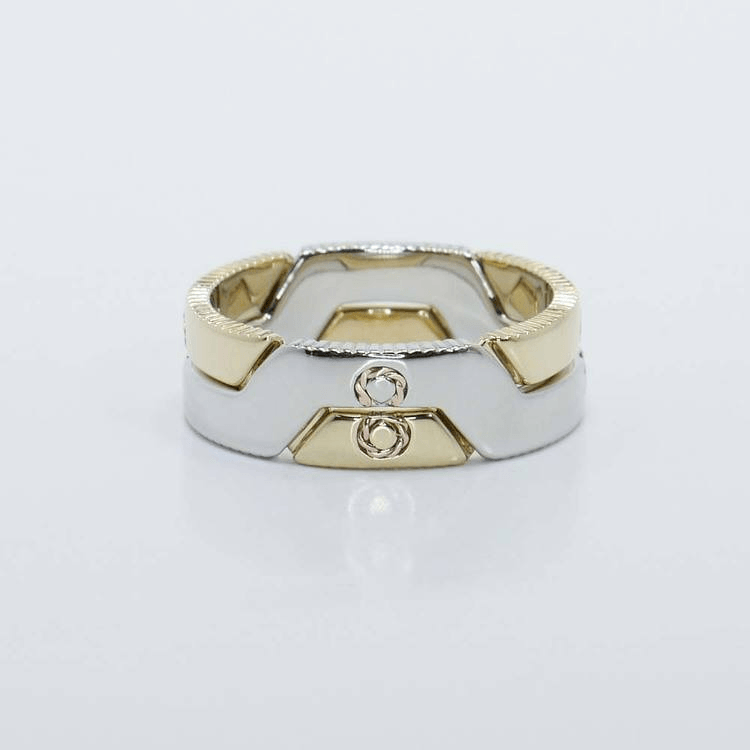 These interlocking bands feature an infinity symbol when joined together, and the design is symbolic of eternal unity. 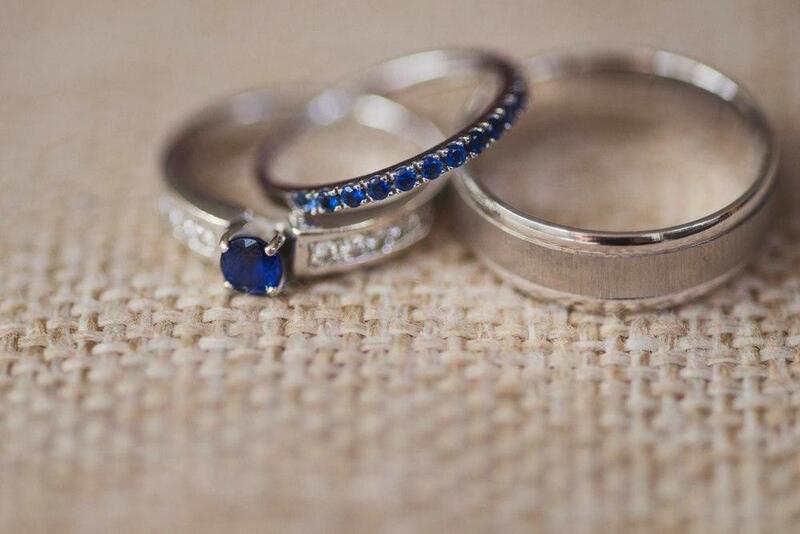 Tradition doesn’t define engagement ring design…you do! Diamonds have had their day in the engagement spotlight. Now colorful gemstone and alternative centerpieces are the focal point for engagement rings. Feel empowered to color your heart and your hand with Brilliance.